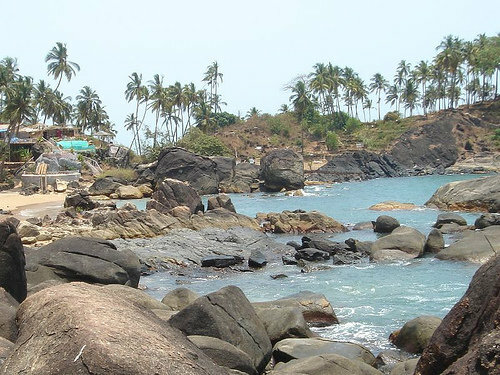 The Patnem-Colomb beach is situated very close to the Palolem beach. It is a combination of two beaches, the Patnem beach, which is 1 km long, and the shorter Colomb beach. The bay of colomb is rocky.The rocks found here are dated back to 2500 million years. A perfect place in the afternoon because of a steady sea breeze. The curving beaches form a horseshoe shape and the palm grove covered landmass being encroached by the sea makes a wonderful sight. The beaches are clean and the water is safe for swimming and clear. Patnem beach is often seen as the quiet and more relaxed. Patnem beach is by no means a secluded little paradise beach, beach huts and restaurants cover most of the beach front all the way from one end the other. There is a good selection of places to visit by yacht for honeymoon holiday in Goa.